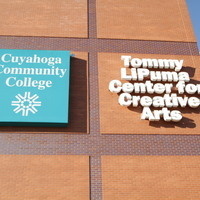 The Tommy LiPuma Center for Creative Arts at the Tri-C Metropolitan Campus provides a unique learning environment for students pursuing studies in a wide spectrum of creative arts disciplines. A joint project between the college and The Rock and Roll Hall of Fame and Museum, the center features 75,000 square feet that bring together many of the college’s media arts, recording arts, performing arts, animation laboratories, and other programs. The center also houses dance and theater studios, audio and keyboard classrooms, music technology labs and editing suites. It also houses The Rock and Roll Hall of Fame and Museum’s library and archives. The Center is named in honor of Cleveland native Tommy LiPuma, one of the most successful pop and jazz producers of all time with 33 gold and platinum records to his credit, 33 Grammy nominations, and three Grammy awards. I really enjoyed the night the energy was strong and positive great performances . I enjoyed the talk. He was very entertaining! !! Plus the food was excellent!